This prefinished Antique oiled oak wooden floor is specially engineered. 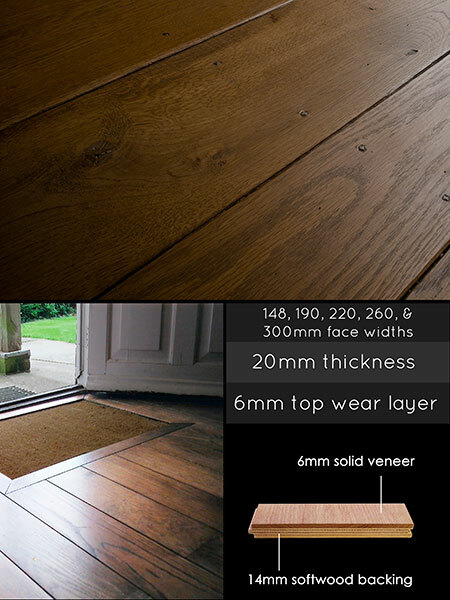 With a 6mm solid Oak top layer that is bonded onto a 14mm plywood timber backing, this old looking wooden floor is an extremely stable floor and can be used safely over underfloor heating. Stable enough for installing directly to existing concrete or timber subfloors and able to span flooring joists. Due to the 6mm oak top this engineered wood flooring has the same longevity as a solid wood floor, but without the stability issues. * Old looking wooden floor. * Thick 6mm Oak top layer. * 70% more stable than solid.